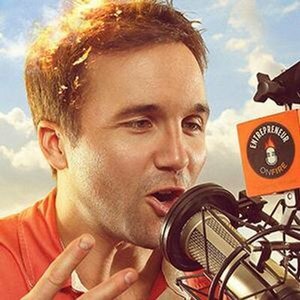 John Lee Dumas is the Founder and Host of EntrepreneurOnFire, awarded ‘Best of iTunes 2013’. John interviews today’s most inspiring and successful Entrepreneurs 7-days a week and has been featured in Forbes, INC, & TIME Magazine. John has turned EntrepreneurOnFire into a business that generates over $200,000 a month & shares all the details via his monthly income reports at EOFire.com/income. John also founded the #1 Pod casting community in the world; Podcasters’ Paradise; a community where over 1200 Podcasters learn how to create, grow, and monetize their podcast in a supportive environment. EntrepreneurOnFire generates over 750,000 unique listens a month & recaps of these 700 plus episodes and MUCH more can be found at EOFire.com. I made a pledge that I was never going to live a life that wasn’t really symbolic of who I was…I wasn’t going to live a life that was less than of I was capable of living. This is John Lee Dumas of Entrepreneur on Fire and I Share Hope. John Lee Dumas is with us today. He’s the founder and host of Entrepreneur on Fire, awarded Best of iTunes in 2013. John interviews today’s most inpiring and successful entrepreneurs 7 days a week and has been featured in Forbes, INC, and Time Magazine..that’s incredible. John has turned Entrepreneur on Fire into a business that generates over $200,000 a month and shares all the details via his Monthly Income Report at eofire.com/income. John also founded the Number 1 Podcast Community in the world, Podcasters’ Paradise, a community where over 1,400 podcasters learn how to create, grow and monetize their podcast in a supportive environment. Entrepreneur on Fire generates over 850,000 unique listens a month and these 700 plus episodes, and much more that I have .found so helpful, are all at eofire.com. John, it is so fun to have you sharing hope with us today. Give me a little more about you and then we will jump into our 5 questions we ask every guest. Well you nailed it, I mean thank you so much for that incredibly powerful intro and I mean just having this chat you know kinda lights my fire..I just love podcasting in general,Chris, and I can definitely share with you that I am prepared to ignite and to talk all things hope today because you know for me everything was based off hope. You know I’m just a country boy from the state of Maine who grew up for the first 18 years of his life there, went to collage under an Army ROTC scholarship, spent 8 years in the Army, 13 months in which I was deployed in Iraq and afterwards, you know, I tried bunch of things in the civilian world from law school to corporate finance to commercial real estate..nothing clicked. It was 6 years of failure and setbacks and obstacles. But couple of years ago, at the age of 32, I launched Entrepreneur on Fire and here we are almost 800 episodes later, having won Best of iTunes in 2013, kicking out a killer episode 7 days a week. It’s incredible, the pace you keep is incredible! I’m podcasting a little more and more, trying to get this thing going and it’s going..but I’m telling you its dragging me along like a team of wild horses. I can’t imagine working 7 days a week. I’m impressed. You guys have got a lot of strong team behind you and some incredible organization. Question 1: What is your definition or best quote about Hope? Well done..I might have you repeat that one in a minute because I think that’s going to come into play on another question. That’s great! Okay, so looking back in your life…. Question 2: Tell me who’s been the most hopeful in your life or I guess better yet..How has that person delivered hope to you in such a powerful way that’s just spurred you on…You’re obviously a person that delivers a lot of hope to a lot of people…Who’s been back there for you? Well, I want build off of what we just talked about because that is my answer for this next question here…and it’s the 800 plus guests that I have interviewed for Entrepreneur on Fire. That is who has shared the most hope with me..because every single one of them shares a failure story..shares a obstacle.. a challenge that they faced and with a little less persistence..with a little less effort..that what seemed to be a hopeless failure would have remained just that..a hopeless failure but because these individuals had more persistence..had more effort..and just stared failure down..they’ve all now turned into wildly successful entrepreneurs..who are living a life on their terms and it’s amazing to see. And so every single time that I get to get on a call with one of my guests, it’s absolutely somebody that just shares the most hope with me. And you know, people ask me all the time like, “John, who’s your mentor?” and I say, “My mentor is every single one of my guest of Entrepreneur on Fire”…who had been through the ringer and back cause I don’t have people in my show who haven’t failed..You know there is a pretty lengthy application process to be on Entrepreneur on Fire. I have over a hundred inbound requests every single month and I only bring people on that have had to deal with serious failures..serious struggles..and are willing to share that story..that are willing to share that journey..that is an absolute requirement..and hearing their stories every single day as I am interviewing them brings me that hope that I need and that inspiration to keep moving forward and that’s exactly my answer. Question 3: So, In your life give me the background…set the stage..when is a time in your life when you’ve had just everything going the wrong way..and you’ve just had to dig in and use hope to come back and stay on it. Well, something that I’ll alluded to, albeit briefly while I was kinda giving my little life story, was my 13 month tour of duty in Iraq and I’ll tell you straight up, Chris..that was a very difficult 13 months. It was during 2003-2004, you know, the bloodiest years of the Iraq War and here I was a 23 and 24 year old Lieutenant in the US Army in charge of 4 tanks, 16 men… I was in the thick of it. You know, they called it a Lieutenant’s War for a reason. It’s because we were the people that were out fighting the fight and making things happen. And you know because of that, because we were in the thick of things,you know, of my 16 soldiers, only 12 made it back. Four made the ultimate sacrifice..and that’s a really difficult thing for a 23/24 year old to really deal with it because that was my responsibility…these were my men and I did not bring them all home and that’s something I will continually have to deal with for my entire life, but one thing that I will say is..I had to stand at the foot of every one of their coffins and you know kinda reflect on the ultimate sacrifice that each and every one of these heroes has made to this country and to freedom in general.. And I made a pledge that day and all four of those days..that I was never going to live a life that wasn’t really symbolic of who I was…I wasn’t going to live a life that was less than what I was capable of living and I knew that I had a lot to give and I knew that I had a lot of inspiration to share and I refuse those four occasions to ever let myself fall onto the trap so many of us find ourselves in..You know, stuck in a cubicle 9 hours a day for some soul draining job..inspiring no one..um, you know, making somebody else rich..doing pointless, pointless work and, you know, I wasn’t gonna let myself get there…and there a couple of times, Chris, that I found myself there. I found myself in those situations and it was that pledge that I made to those four soldiers..They gave me the courage to walk to my boss’ office and hand over that resignation..it gave me hope that I was going to be able to really find my true calling and not get sucked into the life of, you know, what so many people find themselves chained into….and that was it..I mean, that was really what changed everything and allowed me to quit many different career paths and again, it didn’t come quickly..It was over the course of 6 years of struggle…of drifting..of quitting..of failure..of set backs…of mistakes. It was 6 tough years but I continued to have the resolve and the hope that if I just kept on searching, I would find it. And eventually, after 6 years of searching and at the age of 32, I did with Entrepreneur on Fire. The story you get to carry with you the rest of your life is giving a bunch of us a lot more life..so thanks… It’s a great story and a great point of hope in a lot of ways and I think the taking action and being able to translate that hope that you are generating not only with the guys out there in the field but coming back and have to going through the heartache of losing somebody..losing four guys…and turning that into a promise inside your own heart that “I will do something that’s great”… That’s “the size great” that you are..which is phenomenal… and move on that..even if it takes 6 years later..it’s action, and hope without action is really not hope at all. And you are…you’re putting it together. Alright.. Question number four.. You are doing so much these days publicly..so you can go anywhere you want with this.. Question 4: How are you sharing hope on a daily basis with people around you? So, there’s another quote that I am a huge fan of by Albert Einstein and that quote is, “Try not to become a person of success, but rather become a person of value.” And, Chris, all of my failures in life have come from trying to become a person of success..of going to law school..of going into corporate finance and getting into commercial real estate. I was trying to become a person of success, but when I finally realized that wasn’t gonna work for me..and I’ve realized this quote of just becoming a person of value, that changed everything and that’s what Entrepreneur on Fire is. It is just value. All it is is a free, consistent, valuable podcast every single day with an inspiring story from an incredible entrepreneur, some awesome life lessons, some great guidance, some great feedback, some great business tips ,tools and tactics, 7 days a week. And when I went at it that way, of just trying to be a person of value, everything changed. I went from struggling to just thriving, and I went from, you know, eeking out whatever I was making to now avbusiness that is gonna generate over $2.5million in 2014 alone from just focusing on providing value and not focusing on the success part. The success part follows value. That’s really where the key is here. You know, you’re not gonna get to success by chasing success. It’s gonna be attracted to you, if you lead with value. So, that’s what I do now a days, Chris. I just provide free valuable contents to people. So, you know, every single week we do a completely free, live podcast workshop where we teach people how to create, grow and monetize their own podcast. I know you’ve been to it. It’s a blast..you know, it’s one of my favorite things that I do and we just deliver over an hour of pure podcasting value about how to create, grow and monetize your podcast and at the end of the it, I take people through our community Podcaster Paradise which you are also a part of, Chris, and let the people know that if they want to take things to the next level and be part of an amazing community..you know, they can..We give them the opportunity to join at that point. But even above and beyond that, actually, I just actually launched a podcast called The Free Podcast Course Podcast, where it‘s just 20 episodes. I just teach people how to create, grow and monetize their podcast via a podcast. It’s completely free..it’s like a course that I’m delivering via podcasting, which I love. Where do they find that? It’s just anywhere in my podcast..on the website..It’s all over. This is..I promise..Folks listening..This is not a plug that John and I talked about beforehand. But before our recording started today.. I was telling him about how much I’ve enjoyed Podcasters Paradise and it’s given me hope in something that’s so hard to figure out, but now has become so simple and all I wanted to do is be able build a community to grow my own hope and share hope with other people and … Boy! The nuts and bolts of figuring out how to do that. These guys have just put it right out there. I love it! Thank you..It’s our heart and our soul we pour into this community. We absolutely look at Podcasters Paradise as a family and you know we love being part of the community. And above and beyond that, I also am offering a completely free podcast course which people can find at freepodcastcourse.com, where it just takes people through 15 video tutorials of how to do just that: create, grow and monetize your podcast. You know, I’m all about just providing incredibly valuable, free content out there of something that I am inspired by..and you know, I am inspired by podcasting. I’ve seen what it’s done for me and for my business and I want other people like you, Chris, to be able to have the tools necessary to inspire others…to have a ripple effect on this incredible world and that’s exactly what you are doing with your show..and you know I’m honored to have played a part in that and that’s exactly why we create all this completely free material, but of course you know we are looking to lead people into Podcasters’ Paradise, which is our premium community where we have a private Facebook group, where people can engage with each other, ask questions, you know, we do a Pay-It-Forward Friday every Friday where we exchange honest iTunes and Stitcher reviews to really get people’s podcast into the spotlight, which is critical. We have over 200 video tutorials..we do monthly webinars with today’s top podcasters…we just had James Altucher, Lewis Howse, Pat Flynn, Amy Porterfield, Michael Hyatt. I do a monthly Q&A webinar for anybody in Podcaster’s Paradise to just come on and ask questions of me and I’ll answer every question in this live Q&A session.. You know we do accountability matchmaker program where we will match you up with somebody that’s in a similar situation as you and your podcast. And we just had a lot of fun…you know we have all of these opportunities for you the podcaster to really thrive. So many forms..here..just do this. Copy this. Here’s my email I send out to people..copy it! Wow! If people came to us in life in the hardest situations, if it’s a divorce, or loss of a loved one, or chemical addiction…whatever you are coming back from…just a hard, crappy day… and somebody says, “Man, come on with me. I’m going for a walk. Let’s hit the neighborhood and talk it out.” That’s so helpful! Its easy steps! So, John…. Question 5: Tell us how we can take real, core steps. 1,2,3-ABC type stuff to just start becoming people of hope or sharing hope better. So, there’s a quote and we’ve kinda share some pretty powerful quotes but I think this will be a great one to leave everybody with…Chris, if you want to be..do. If you want to be somebody that has hope..actually seek hope. You know, if you want to be somebody that gives hope, then, you know, seek out those who are giving hope and emulate them..You know we are all standing here on the shoulders of giants and I’ll tell you that when I first wanted to podcast, I had no idea how to podcast, but I had to just podcast. If I wanted to be a podcaster, I had to podcast..If you want to be an author, you have to write..you know, if you want to be someone who gives hope, you have to start giving hope..I mean, if you want to Be..Do. It’s really a simple phrase..but so few people actually take that action..So for me, Chris, for you….I mean, you know, with the medium we are using podcasting to deliver hope..to deliver inspiration..to deliver a message..our message…our voice..our brand to the world..you know, we are taking action and that’s really what I want to leave people with..If you want to join me in sharing hope..take actions. You know, If you wanna be a person of value..deliver value. You know, anything you can think of…If you just remember that core phrase.. “If you wanna be…DO…” You have to start doing it..Kobe Bryant, he did not make his first foul shot..But he kept shooting foul shots and he became a good foul shooter…Paul McCartney did not strike a perfect G chord the first time he strummed a guitar, but he wanted to be a musician, so he kept doing it. Anybody, that you see that has achieved anything has actually, number one, been horrible at it when they started–and there’s no way to avoid that ..and number two, kept at it…they kept doing it…and now they are amazing..
Oh!I like it! If you want to be..Do..did you say that was Einstein? Alright! So, If you want to be ..Do..That is critical..and in every interview we had so far..It comes down to action..it comes down to getting up off the couch..out of your brain..out of the spiral..and taking action…John Lee Dumas is a phenomenal example of that. So, the next thing for you, John, this is not one of the normal five..but it’s in there…we like to know…if you are just in the funk and you gotta have something rockin’ in your ears..what are you gonna play when you need things going? I’ll tell you right now..and this actually leads perfectly into an incredible documentary I just watched and it’s free on Netflix for anybody to watch…It’s The Eagles documentary..It’s unbelievable..So just search “Eagles” in Netflix..watch that 3 hour epic tribute to the Eagles., and that will be my answer..is I would listen to a little Eagles..maybe a little peaceful, easy feeling! That’s the next question. First of all, I want to know how can they reach you? And then also, if there’s anything you can offer, because I know you do it in all of your shows that I listen to. You always hand something out that’s very valuable and a good example of sharing hope. So, how can we reach you and what do you have? All the magic happens at eofire.com and that’s gonna be a really easy lead into the gift that I have for your listeners just as a thank you for listening this far into the episode and for hearing my voice. You know, we talked a lot about podcasting and about how we offer a lot of free stuff, but something that is not free that is out there is my book Podcast Launch which is the number one ranked book in all of Amazon..in podcasting..with over 300 five star reviews. It comes with 15 video tutorials. But I want to give that for free to your listeners and Chris, for them to grab that gift, just go to eofire.com/gift..No email opt-in, it’s just sitting there waiting for you, completely for free..and I am excited! Wow, that’s great, John. I’ve not read that book yet and I have heard you mentioned it a few times. Am I allowed to get one of those for free as well? Head over to isharehope.com and you’ll find all the show notes for today’s episode..Just look for episode #1 with John Lee Dumas. All of the information that he was sharing–the links to his websites, how to follow him, and also information about the free book he is giving away–is right there in the show notes. Also you can join the discussion underneath today’s podcast notes. Look forward to seeing you there and |’lI look forward talking to you again soon! You’ve just listened to I Share Hope. If you are ready to make a change, head to our website at www.isharehope.com and claim your free copy of the top ten actions of hope from World Leaders to use hope in your own life. Thanks for listening and we’ll talk to you next time.